H, being a practical man... I accepted the fact that he will not bring home a bunch of lovely roses, he would just cut some from our garden... and secretly hoping to dig the rose bushes out too... To him, its a waste ~ as flowers wont last. Designer bags? I dont fancy that either... those days of wanting to look chic and cool... to be seen carrying one is over.. So what do I want or need?... My 'Want' list can go on and on and on... but 'Need'?... yeah Mr 'Need' always stop me in my track ... I have to be practical ... living with pragmatic man ... as well as to set a good example to the kids, so they can be more prudent in digging the coffers...*cough*... our coffers ... and weigh their needs and wants too!!! I am participating in Muhibbah Malaysian Monday hosted by Suresh Chong of 3 Hungry tummies. and I am sending off this post to the event... See you there.. 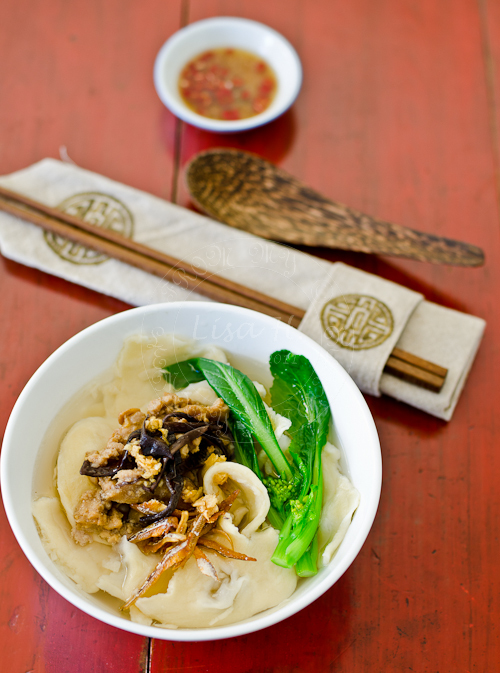 Prepare Noodle ~Place the dry ingredients in a mixing bowl and add the wet ingredients. Knead into a dough. Set aside to rest for at least 30 minutes. Prepare Meat Toppings ~Saute chopped garlic till fragrant. Add in mince chicken. Cook until the chicken turn slightly opaque. Add in sauces, sugar, and sesame oil. Keep stirring until chicken mince is cooked through. Mix corn starch with water and add onto the mince mix. Cook until the sauce thicken. Season with salt and pepper. Set aside. Prepare the garnshings and set aside. Mix the cut up chillies with lime juice, light soy sauce with chopped garlic in a bowl and set aside. Prepare Soup ~Mix everything in a medium size pot and bring to boil. and leave it to simmer with its lid on. To serve~ Bring a pot of water to boil, flatten and tearway or pull-apart the dough into the size of 50 cents coin, and drop it in the boiling water. The tearaway noddle is ready when it floats up. Scoop up with slotted laddle and into serving bowls. Top with meat toppings, garnish and ladle some soup into the serving bowl. Serve hot with some cut up chillies. Lovely writeup ..... cool recipe and beautiful clicks ! 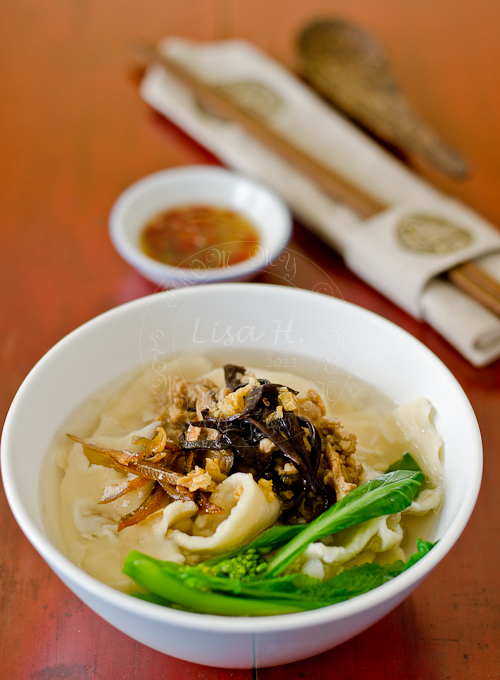 Homemade noodles in anchovies based stock...and delicious chicken topping..that sounds and looks just irresistible! I want this because Malay style noodles always suit my appetite. I also need this since your dish has made me feel hungry : ). I pun suka pan mee n pun selalu makan kat Midvalley tu. Pernah buat jugak masa kat sini sebab my anak2 pun suka. Kat MidValley Oasis Garden tu laksa penang dia pun sedap kan. Used to have lunch there because my old office was just nearby. MidValley was our lunch time favourite. I recently tried oyster sauce at a Thai restaurant & love it soo much!This is just my kind of dish, brothy with neat chunks & veggies- Love the pretty bok choy sitting on top! yum yum, I never get fed up eating pan mee. I like to dip with basil sauce. 1 bunch oriental sweet basil leaves, 3 to 4 cloves garlic, bird eyes chili - chopped finely add sugar, salt, vinegar to taste. Keep chill in the fridge before use. Enjoy! That sounds like a wonderful (and creative) Mother's Day treat. I think the effort in making this dish worths more than a diamond,don't you agree? hehe! That noodle dish looks marvelous! What mouthwatering flavors. Yummy. It looks really good! Homey goodness. I like my Pan Mee with runny-yolk egg, and fried shallots! Such simple tastes you have dear :) Actually, I would love a bowl of perfectly cooked noodles for a present too. I love and miss pan mee, we used to eat it often for breakfast. Great entry. A lovely noodle soup! It is the first time i hear about it. What a beautiful blog, Lisa! I just "discovered" you today. I will be returning for sure!